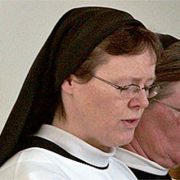 I first knew that I wanted to be a nun at the age of fifteen. I did not know how to go about it or who to talk to, so at the time I did nothing. I was a little distressed by this realisation and was not sure whether it was real or not – another reason to do nothing. I told no one. At the time I was very caught up in school and hockey and enjoying life in general. I felt there was no point in upsetting this balance. I finished my studies at school and went on to study in Maynooth. I also continued to play hockey at club and inter-provinial level. My sense of vocation had not diminished even though as yet I had made no efforts to do anything about it. But what I did notice was that even though I was studying for an Arts degree I was spending an increasingly larger amount of time in the theology section of the library. I had begun to read avidly about the spiritual life. I was becoming aware that many of the insights of modern psychology seemed to have been discovered a long time ago. In particular I found the wisdom of the desert Fathers and early church Fathers rich with insights on the serious subject of living. Around this time I started to look for a spiritual director. I found one, a Cenacle sister. She helped me to focus more carefully on my prayer and with her help I discerned my next decision. I decided to visit a Benedictine monastery in England. I spent a week there and in that time felt very drawn to their way of life. I asked if I could try my vocation with them. I spent two and a half years with this community and although I experienced a lot of happiness there I also felt it was not quite what I was looking for. It was at this time that I discovered the existence of the Cistercians in Ireland. I made further enquiries about St Mary’s Abbey and in due time left England and entered the Cistercian way.